It’s always great to hear about new pie ventures close by to you and “The Stable” in Birmingham city centre had been recommended by a number of colleagues at work. With an interesting mix of Pizza, Pies and Cider it seemed a good opportunity for a social evening with friends from my badminton club (well I’ve got to keep the pie calories at bay somehow!) Would this specialisation in pizza, pies and cider help its pie rating, focusing on the pastry beauties? With a range of four meat and one vegetarian pie on the menu, I went for “The Steak Out” – a beef, stout and horseradish pie. It was nice to see a decent selection of pies on sale, more than your average restaurant menu (bar pie shops, of course!) These pies are apparently hand-crafted in the West Country, from where the company originated, and are sold exclusively throughout the various “The Stable” outlets across the country – with a new London store the latest to be announced this week. 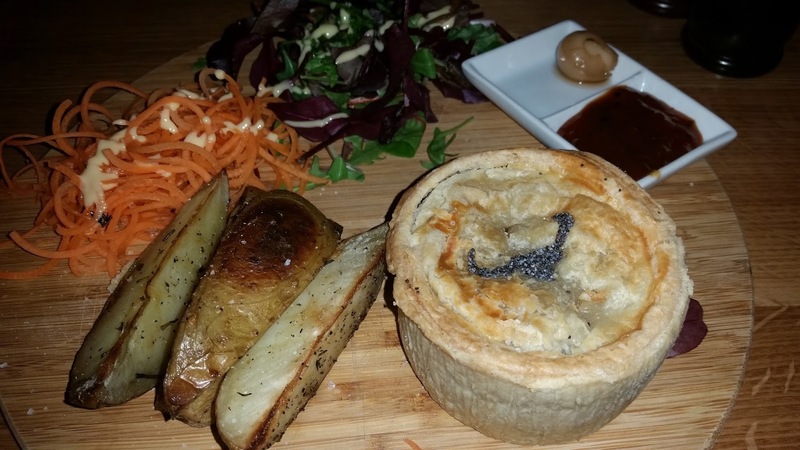 The Steak Out is their beef pie, served with herb roasted potatoes, pickled onion, tomato chutney and a side salad. The meal is nicely presented on a wooden board and each pie is personalised on top with a specific image related to the pie (bull’s horns, in this pie’s case!) At £9.50 this is a quite reasonable price for a filling pie meal, especially in a city centre location just minutes from the main train station, even if the pie could have been slightly bigger for pie-fection at this price. ﻿Overall I was very impressed with this pie meal. Well filled with a meaty content and a nice soft pastry, it did a good job on the 7 Cs of pie rating. There were a few minor faults to comment on but I enjoyed the meal and will certainly be going back to try the other flavours. One noticeable comment was that the pie was a bit pale, especially on the sides and base, which does detract from its colour score. The side pastry held together but was quite soft – which is a lot better than the overly dry thick pastry on a lot of pies I’ve rated, but could have been a bit crisper. The lid was a bit more golden and crispy, which I enjoyed much more, but the softness made it tricky to pick up by hand. It therefore did very well to hold in the meaty content, which you can see on the cross-section was very well filled to capacity. There was a bit of an air gap but in general this pie scored well for capacity. The content itself was nice and flavoursome, with a good meaty taste. 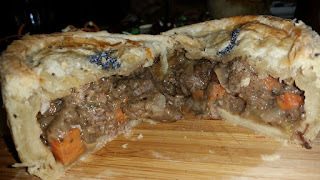 There was certainly plenty of meat in the pie, even if one of the pieces of beef was a bit chewy. Overall the filling was moist but could have done with a little more gravy filling in my opinion, with some of the meat a little dry upon chewing. But the flavour of the sauce was very nice and it was a great pie I’d happily order again - although next time I’ll be looking to rate another one of their fine looking pies! A definite Pierate Recommended pie to add to our Best pies in Birmingham article!